This past week I was reorganizing and purging in our bookshelves when my eye fell on a particular cookbook and set off my sweet tooth. I have only ever made one recipe out of this cookbook, but it will always have a place on my shelf, safe from gifting or donating. Why? 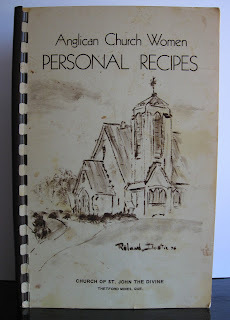 This cookbook was put together by my grandmother's church as a fundraiser and contains her recipe for Chocolate Sauce. It's a very simple recipe and you might even have all the ingredients in your pantry right now. Melt the butter, add chocolate, and stir over very low heat until melted. Add boiling water slowly, stirring constantly and bring to a boil. Add sugar and corn syrup stirring until dissolved, cook 5 minutes. Add vanilla and salt. Serve hot or cold, though I recommend hot. Of course, I had to make some this week. We had it over vanilla ice cream (which I recommend, it is pretty sweet) watching game 6 of the Stanley Cup Final. This sauce is fairly thin when hot, then thicker and almost chewy as it cools over and under your ice cream. It's so nice to have something on your ice cream with ingredients you can pronounce that doesn't taste manufactured! Mmmm! Looks yummy! Thanks for sharing.